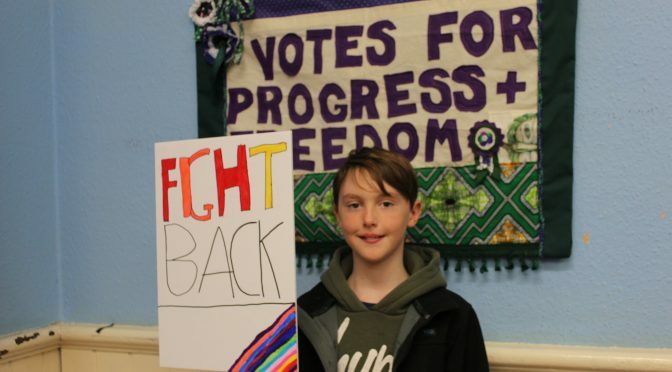 On 3 November, we ran our second Vote 100: Born a Rebel event at Shakespeare Hall in Durham! At the start of the event, we all helped ourselves to cakes, sandwiches and sat down to watch Vote 100: Born a Rebel on the big screen. The chair and a couple of the panelists were teary-eyed when they stood up after the film to tell us their ‘demands’ for the future of the UK for its women, and to discuss how they could make that happen. The conversation saw some really varied and interesting viewpoints being discussed in a friendly, respectful way. This was also the tone of the group discussion that followed, from which the attendees drew up their own list of demands, ranging from the political, to the civic, to the familial. We then took a short break and got ready to watch the fantastic The Divine Order (with more tea and cake of course), while we ran a workshop turning our demands into placards! Our next Vote 100: Born a Rebel event will be taking place in Huddersfield on Sunday 17 November. Find out more about our Huddersfield event and get your tickets here.